The proposed law, approved by the Chamber of Deputies but now stalled in the Senate, protects the rights of juveniles in the labor market and penal system and commits the government to provide resources for youth and children’s services. It also affirms the current minimum working age of 14, as required by International Labor Organization (ILO) Convention 138, to which Bolivia subscribes. But Bolivia’s Union of Child and Adolescent Workers (UNATSBO), with 15,000 members in seven of the country’s nine departments, wants to abolish the minimum age for independent, unsalaried work, and set a minimum age of 12 for all other jobs. UNATSBO, which defends the rights of children in the workforce and establishes programs to improve their working conditions, is one of eight child worker unions in Latin America, that are funded primarily by international NGOs. On December 17, a UNATSBO contingent protesting the proposed law was pepper-sprayed by police when they allegedly sought to enter the Presidential palace. At a subsequent meeting with child worker representatives, President Evo Morales declared himself in sympathy with their position. While the government shouldn’t encourage child labor, Morales opined, or allow child workers to be exploited, a continuing ban is unrealistic and counter-productive. Citing his own work experience as a young child (harvesting sugarcane, making bricks, and selling ice cream, among other jobs), Morales affirmed that child labor is a necessity born of poverty, and can also help to build social conscience. Morales’s controversial remarks, and the debate over Bolivia’s proposed law, call attention to the continuing challenge of child labor in impoverished societies. Some 166 nations (excluding the United States and Canada) have ratified ILO Convention 138, contributing to a 30% decrease in global child labor rates since 2000. Still, the ILO reported 168 million child workers worldwide (underage and/or working under dangerous conditions) in 2012, including 12.5 million in Latin America. In Bolivia, existing laws ban children under 14 from the workforce, and exclude juveniles under 18 from 23 categories of dangerous jobs (in accordance with another ILO convention, which UNATSBO supports). Still, a 2008 study found 850,000 children and adolescents (around 28% of the juvenile population) working in violation of these norms. Contrary to the stereotypical image of urban sweatshops, most Bolivian children work part-time in the informal economy—shining shoes, collecting bus fares, selling trinkets, or helping their parents in market stalls or on family farms. But thousands also toil long hours in isolated mines, in the sugarcane and Brazil nut harvests, or as domestic servants—some of the most exploitative and hazardous jobs in the country. According to Human Rights Watch, the Morales government has made significant strides in reducing child labor through improved monitoring of working conditions, enhanced access to education, and cash transfer programs like the Juancinto Pinto benefit, which provides an annual grant to primary school children to cover school supplies, uniforms, and transportation costs. 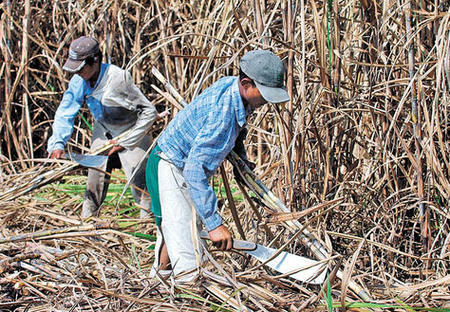 The ILO recently recognized the successful efforts of major sugar refineries in Santa Cruz, working with the departmental government, to reduce child labor by almost 80% over the past six years. Outside Bolivia, commentators and politicians from all sides of the political spectrum have found common ground in criticizing Morales’s views on the matter. Marxist sociologist James Petras has blasted Morales for legitimizing a “reserve army” of exploited child workers who will depress wages and replace militant adults in the labor force. Osvaldo Andrade, president of Chile’s Socialist Party, has questioned how Morales can still call himself a socialist (taking a convenient swipe at Morales’s criticism of President-elect Michelle Bachelet’s socialist credentials earlier this year). The conservative Breitbart news network has reveled in what it calls the “heavy international backlash” against Morales for his remarks. But it is UNATSBO that takes the strongest pragmatic stand in defense of child labor. In a country where poverty—despite recent improvements—is still widespread, and 70% of the working population has unstable, low wage, unprotected employment, child labor is often essential to the family economy, they argue. Moreover, a ban doesn’t prevent child labor but only forces it underground, making it harder to regulate. What’s needed, Medrano says, is better regulation of child labor conditions to prevent exploitation. 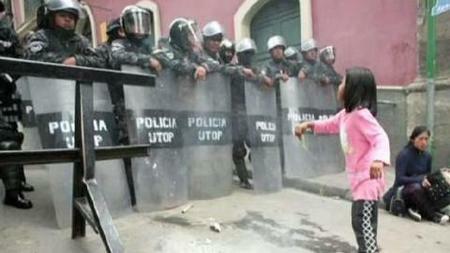 (Currently, according to Human Rights Watch, Bolivia has only 78 inspectors to monitor 850,000 child workers.) UNATSBO also wants more and safer part-time jobs for juveniles who need or want to work. UNATSBO cites the significant gains achieved by child workers through their collective efforts. 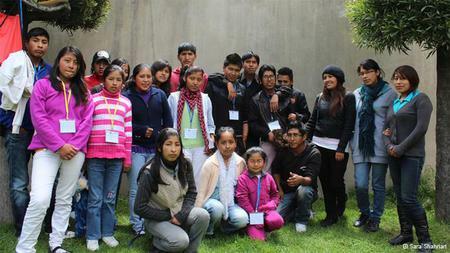 Organized child news vendors in Potosí won a substantial pay raise. La Paz’s notorious masked shoeshine boys self-publish a bimonthly newspaper to augment their earnings, taking classes required by their NGO funder in exchange. La Paz Mayor Luis Revilla has recognized their profession as a dignified job, and as a cornerstone of the capital city’s economy. Like much else in Bolivia, child labor is a complex issue that benefits from being understood in its socio-economic context, rather than from the perspective of one-dimensional international norms. As Bolivian sociologist Fernanda Wanderley has written, UNATSBO’s demands are worth listening to. Faced with massive state and societal indifference, she argues, 850,000 children who work are only asking not to be criminalized. A society that condemns its children to a life of poverty by its inability—despite the best intentions—to guarantee universal access to free, quality education and healthcare cannot reasonably punish them for trying to improve their lives. Without comprehensive social policies that make child labor unnecessary, she concludes, child labor bans may only serve to intensify social exclusion and the vulnerability of children’s rights.